Manhattan District Attorney Cyrus R. Vance, Jr., today announced the indictment of A.J. BLACK, 49, a chef and restaurateur, for stealing approximately $328,000 over a four-year period by failing to remit New York State sales tax collected at his restaurant, as well as failing to file New York State quarterly sales tax returns for the same period. 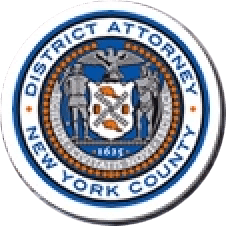 The defendant is charged in a New York State Supreme Court indictment with Grand Larceny in the Second Degree and Criminal Tax Fraud in the Second, Third, and Fourth Degrees. According to documents filed in court and statements made on the record in court, BLACK opened Il Tesoro in 2011, and between September 2011 and June 2015, acted as the chef, manager, and owner of the restaurant, which served customers at its location at 1578 First Avenue and through online ordering services. During this time, however, the defendant failed to remit any sales tax collected on the sale of food and beverages to New York State. BLACK, who was also under obligation to file quarterly sales tax returns, failed to do during this time, and over a four-year period, Il Tesoro generated approximately $3.7 million in taxable sales and collected approximately $328,000 in sales tax, none of which was remitted to New York State. Assistant District Attorney Stephanie Oliva is handling the prosecution of the case, under the supervision of Assistant District Attorney Anne Ternes, Deputy Chief of the Tax Crimes Unit, Assistant District Attorney Peirce Moser, Chief of the Tax Crimes Unit, and Executive Assistant District Attorney Michael Sachs, Chief of the Investigations Division. Investigative Analyst Stasie Levin, Financial Investigator Je T’aime Mann-Athanase of the Forensic Accounting and Financial Investigations Bureau, Rackets Investigator Samuel Morales, Senior Rackets Investigator Anthony Santoro, and Paralegal Claire Ogburn assisted with the investigation. District Attorney Vance thanked the New York State Department of Taxation and Finance—in particular, Tax Auditor I Shumaila Qureshi, Tax Auditor III Ronald Chan, and Investigator Marianela Muriel—and GrubHub for their assistance with the investigation.